Framber Valdez is sticking his name in the hat for next year's pitching staff. The lefthander tossed five innings of two-hit ball on Sunday with three walks to get his second major league win in his second big league appearance. Houston got all of their three runs in the third and held on for a 3-1 series sweeper over Anaheim to keep their 1-1/2 game lead over Oakland in the A.L. West. Seattle lost again and has slid back to 6-1/2 games behind Houston. Evan Gattis singled and Max Stassi walked to open the third against Felix Pena. One out later, Alex Bregman loaded the bases with a sharp liner to left. After Jose Altuve popped out, Carlos Correa drilled a two-out liner past the shortstop for the first two runs of the game. Marwin Gonzalez slapped a base hit to right for the third Astro run. In the fifth, the Angels started their own rally with a walk and a single. Valdez got the next three runners on ground outs which was enough to get Jefry Marte home when Kole Calhoun beat out the relay throw to first on a potential double play. That 3-1 count was it for the day despite some stunning defense in the 80-degree sun before 37,530 at the Big A. Brad Peacock tossed two shutout innings and was followed by Hector Rondon and Roberto Osuna. The Astros' seven hits were divided among the first seven hitters in the lineup. George Springer made a pinch-hit appearance in the ninth and it was announced he would return to the lineup Monday. Meanwhile, it appears Lance McCullers is being shut down for the rest of the season. Officially, his throwing program is being "slowed" but Manager A.J. Hinch said he was doubtful McCullers would appear again this season. The final head-to-head series of the year with Oakland takes place at Minute Maid Park the next three days as Gerrit Cole (11-5) leads the Astros into battle Monday night at 7:10 pm Central. Lefthander Brett Anderson (3-3) will take the mound for the Athletics. Cole is 2-0 with a 2.92 ERA in four starts against Oakland. 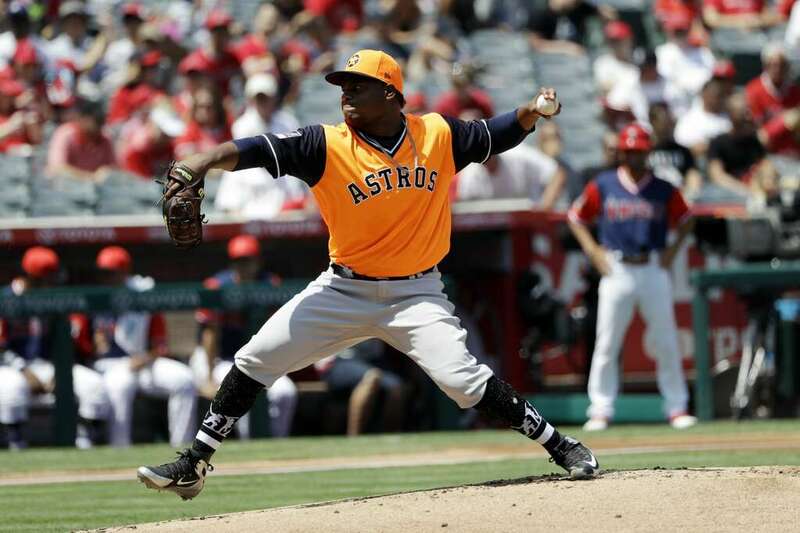 Anderson, who hails from Midland, is 0-1 this year against the Astros in one start. Houston recovered from a 1-2 start in Oakland to finish 6-3 on the road trip, winning the past five straight. The A's have just finished taking 3-of-4 on the road in Minnesota.